Welcome to the second installment of my Holiday Home! My kitchen is dressed in a bit of Christmas flair, ready for friends and family to drop by! You can enjoy another week of home tours by following the links at the end of this post. Thanks to Krista at The Happy Housie for organizing this week’s tour. The home before me on today’s tour is Laura’s who blogs at Inspiration for Moms. I just love her style and today she shares her master bedroom. I’m sharing my favorite room in the house – my kitchen! I love cooking and am quite fond of this humble room even though it’s not modernly chic. Instead, you’ll find lots of free standing pieces of furniture that provide all the functionality I need. This charming little tree is a new find this year from a local country store called Country Naturals. 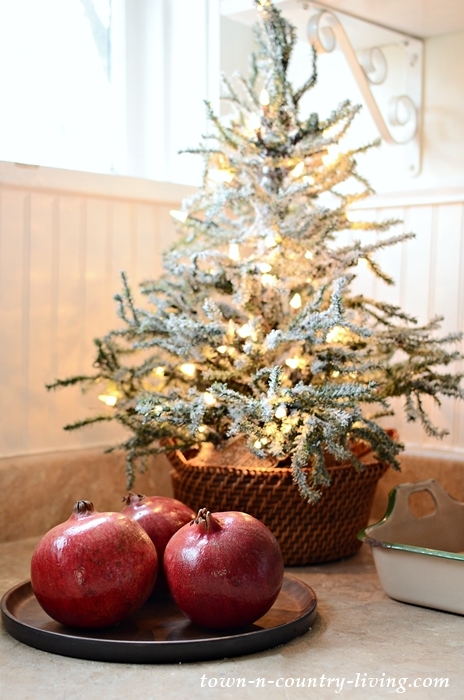 The pomegranates add the perfect shade of red for my holiday home, but I also like eating them! Here’s what the little Christmas tree looks like when it’s not lit up. Still cute! Part of the reason why I love my kitchen is because I love cooking and baking. I just don’t get to spend as much time in here as I’d like, but I did make some chocolate souffle over the weekend. I’m sharing the recipe tomorrow here on the blog! 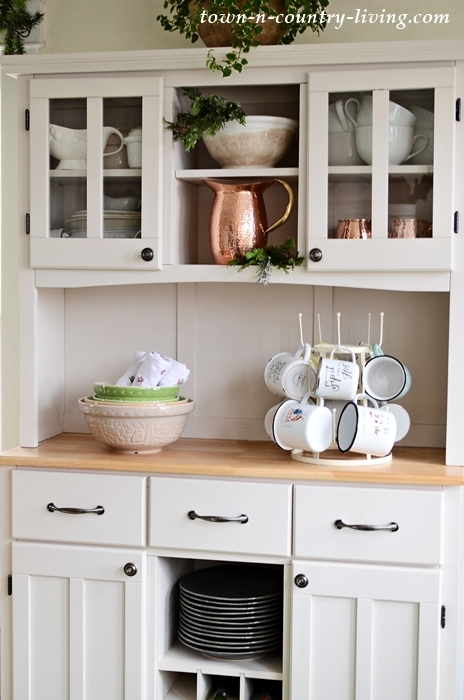 My newest kitchen hutch holds white and gray dishes, along with a few copper pieces. I’ve tucked a few greens here and there to create a holiday home. My Mason Cash bowls cradle a set of holiday napkins. Everyone asks where I got this kitchen sideboard. I bought it from a friend who got it from IKEA but unfortunately, it’s been discontinued. 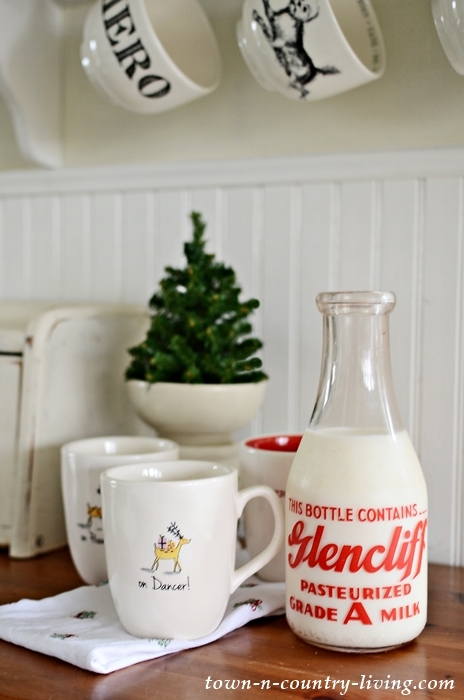 My little milk bottle always makes its appearance at Christmas with its fun red color. The kitchen is the only room in my holiday home that gets a touch of red this year. 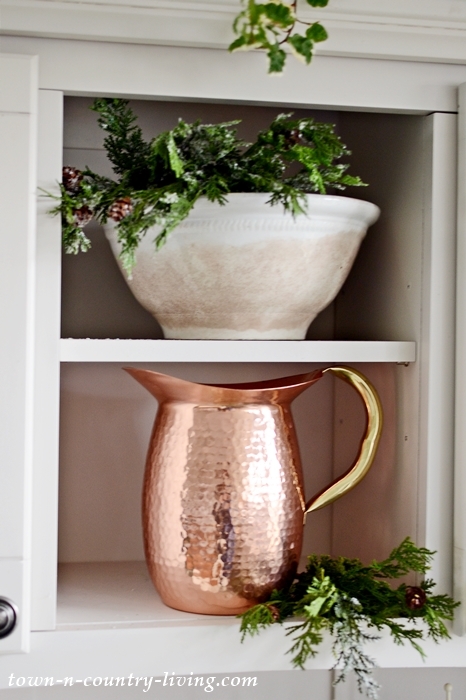 The rest of my Christmas home tour is decorated in bronze and neutrals. 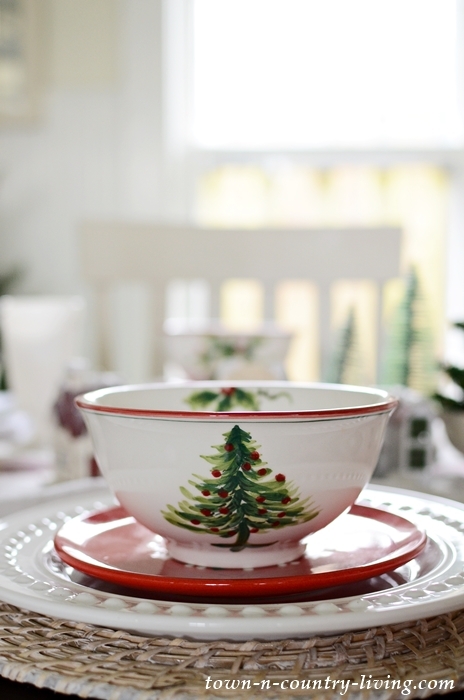 Christmas dishes make a festive setting in my breakfast nook. 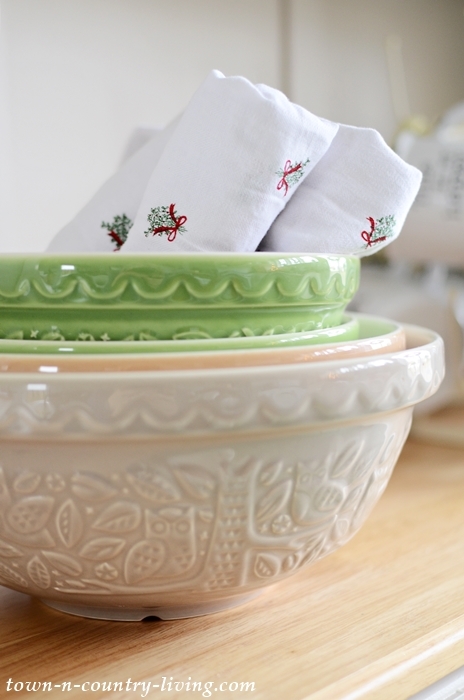 Deep Christmas tree bowls are perfecting for serving oatmeal or soup. 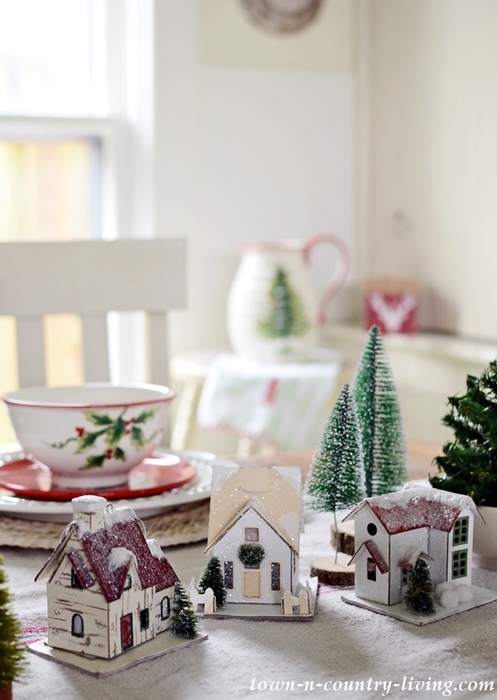 Little putz houses create a cute and simple holiday centerpiece. The final accoutrement to my holiday home kitchen nook is a Christmas tree in a basket. 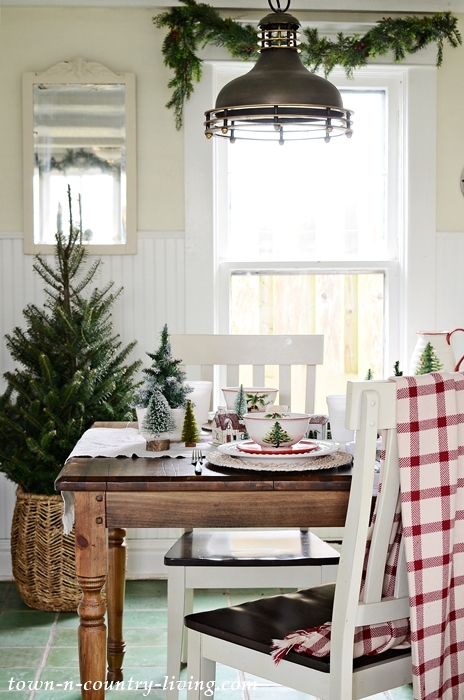 Last week I shared part one of my Christmas home tour. Next week I’m sharing the final tour of my holiday home on Monday. The talented Diane at In My Own Style is next up on today’s tour. Listed below are the participating bloggers. You’ll enjoy a little Christmas cheer with each one you visit. Jennifer, I love your Christmas kitchen! 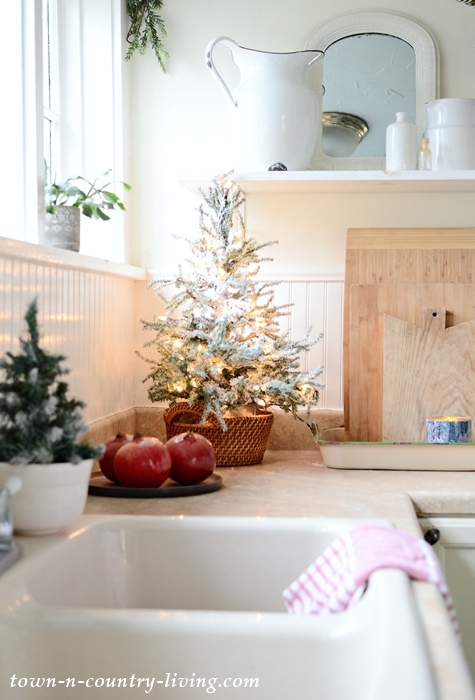 Your little trees on your counter and in your nook are so pretty. And I love those tree bowls — got to get me some of those! Jennifer, your kitchen is fabulous. I love all of your pretty little trees and that little village on the breakfast table is stunning. Beautifully decorated for Christmas. Jennifer – another amazing Christmas tour. Your home must feel so welcoming and cozy. I love the little tree on the counter. It is shaped perfectly and is a perfect size. Can’t wait for your next tour. I absolutely love your style and what you’ve done with your vintage home. 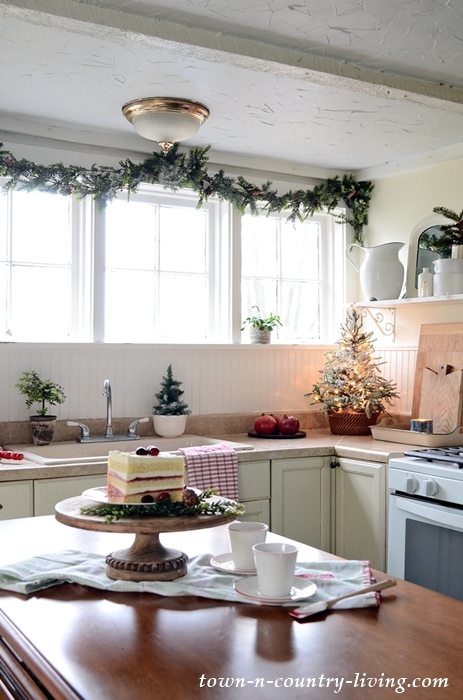 I always love a Christmas kitchen and yours is so charming, Jennifer! 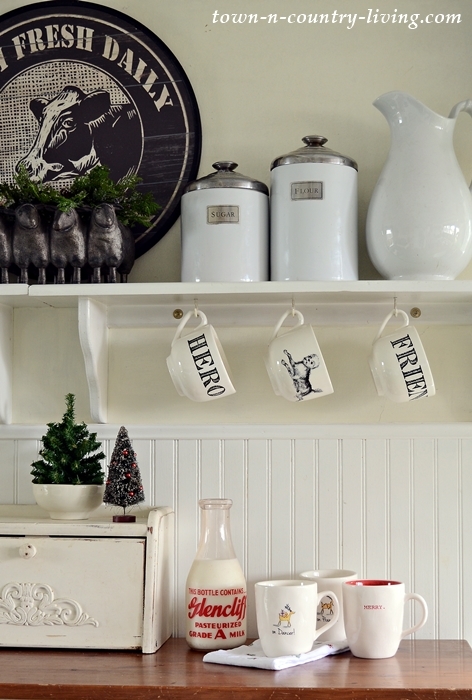 I think they are my favorite spot to decorate because the kitchen is where so much of the holiday season actually happens – baking, cooking and gathering. Have a great week! 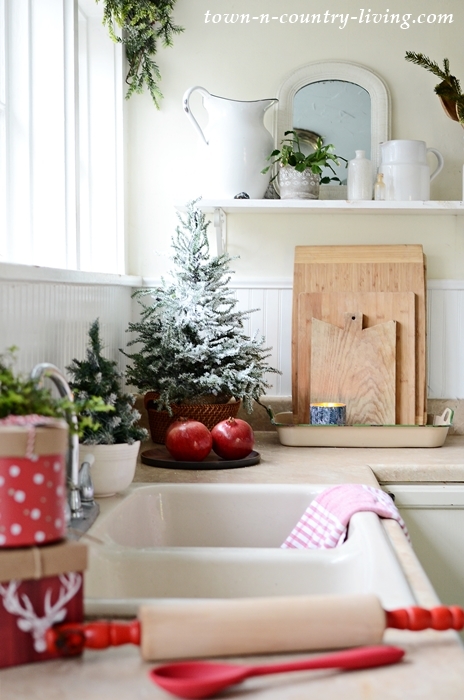 I love everything about your kitchen dressed up for the holidays! Those reindeer mugs are too cute and all of your little trees. I love the light fixture over your breakfast nook too! Love your holiday kitchen!!! I buy that same cake at BJ’s, strawberry shortcake, oh, yum!!! Well i love your kitchen decorated or not but, it is certainly a pretty place to eat now. Hi Jennifer – I always enjoy your posts and tours. 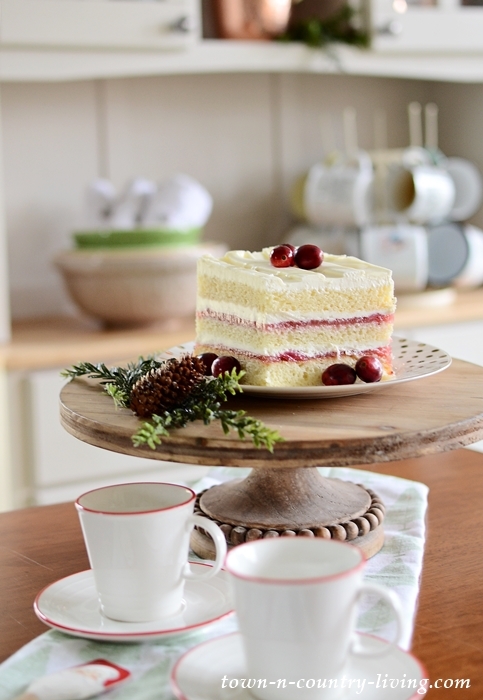 You have so many interesting, unique and colorful collections in your kitchen that make it so welcoming… plus that cake looks delish! I always find myself looking over every photo so I don’t miss a single detail. I love all of your simple classic touches, Jennifer! Those bowls with the painted trees are so pretty. I never get tired of seeing your beautiful home, friend! 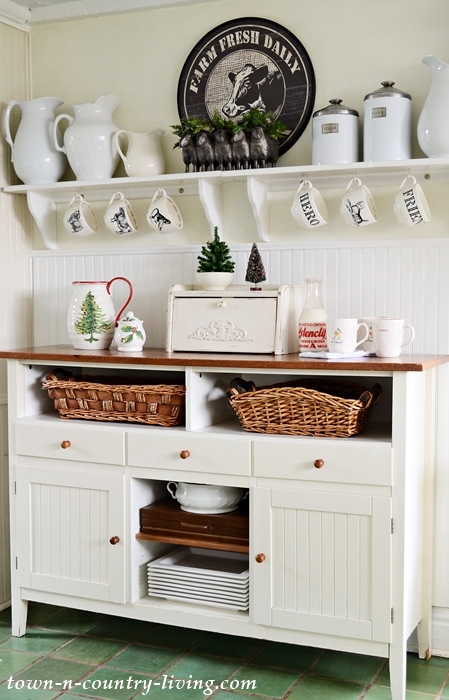 I love all the little touches of Christmas all around your kitchen. 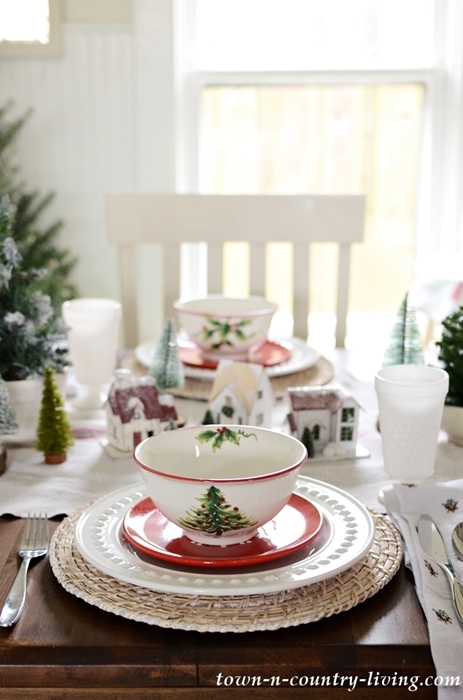 From the greenery of the trees to the decorative bowls…all very classy. Thank you for sharing your kitchen tour. Your kitchen is darling and I want to eat that cake! So pretty! What a lovely kitchen. Enjoy your new hutch! !